What Exactly is Garden Design? If you are thinking of revamping your garden and turning it into a more usable space, a bit of time thinking like a garden designer can make all the difference. But what exactly is garden design?- read on and we'll start the process of demystifying it for you right here! Garden design, planting design and gardening are not the same thing. Image: Verve Garden Design. I meet a lot of people who think that garden design is all about plants. It isn’t! Garden Design considers the garden as a whole and plans the physical elements as well as the living ones. Planting Design is a specialist part of creating a successful garden and the emphasis on it will depend on the lifestyle, interests and skills of those who use it. Gardening is the process of tending to the plants and maintaining the success of the borders, making sure that they remain healthy and looking good over time. Although most people want some plants in their gardens, for a designer these are usually part of the furnishing phase towards the end of the design process. A garden is almost always more than simply the planting beds and borders. Even very keen gardeners with many plants still invariably have beds of specific shapes and sizes, paths that interconnect them, utility areas to help maintain the plants and seating areas to enjoy looking at them. On the other hand, modern residential gardens are tending to focus more on outdoor living and entertaining, with plants and gardening not always being the main focus of the owners. Garden design evaluates the needs, wishes and lifestyle of the garden users- these are almost always the starting point of planning a garden. Garden design follows a process. Image: Verve Garden Design. Deciding What You Want and Need in Your Garden. Analysing the Site Carefully to Identify Strengths, Weaknesses and Opportunities. Determining the Most Appropriate and Desirable Spatial Arrangement of the Elements Required in the Garden. This is usually worked out on paper (or a computer) by producing a sketch plan using shapes that are drawn to scale. We believe that if you can draw a shape that looks even vaguely like a square, rectangle and circle, you can sketch a garden plan. If you really can't manage that, use a stencil or print some shapes out from the computer and draw around them. Designing the Detail of Each Individual Element Before Construction or Implementation. This will include the design of the planting areas and the plants within them. Keep It Simple. (usually known as KISS or Keep It Simple Stupid- but I didn't want any of my lovely readers thinking I was insulting them!). Resist the temptation to include everything you have ever wanted in your garden to avoid it feeling too busy. Balance. Don't have all of the large or tall elements in one area of your garden but spread them out for a more balanced look. Unity. Repeat some materials, colours or shapes throughout the garden so that it feels like one comfortable space rather than a disjointed jumble. Function Before Form. It doesn't matter how good something looks or how much money it saves-if it doesn't perform as you need you will regret including it. Think uncomfortable chairs, gravel paths by the door that get stuck in shoes and scratch your lovely wooden floors, bins hidden at the bottom of the garden that keep you soaked in rainy winters etc. Actually, there are many design principles but don't despair. Even applying a few will make a huge difference to both the design of your garden and your planting. Over time, we will be exploring these in a lot more depth on the blog- so make sure you have subscribed to our newsletter to keep up to date. Garden design is practical as well as pretty. Image: Verve Garden Design. To design a successful garden, you have to get some of the less pretty things right to avoid disasters. You need to get the drainage right and make sure that water flows away from the house, into areas that are not prone to flooding and are permitted by your local authorities. You need to consider the utilities needed for lighting, water pumps and irrigation. You need to think about the easiest route to access elements that are used frequently. Where are you are going to store stuff that you don't want to be in view? You need to know the local regulations governing the height of fences, trees and hedges and the rights of your neighbours. What is safe for your kids and pets? Do you have enough access space to get those large paving slabs you like into the garden? While you don't need a PhD in Landscape Architecture to get your backyard into shape, it is important to think through the practicals as well as the pretties- or at least check with someone in the know. 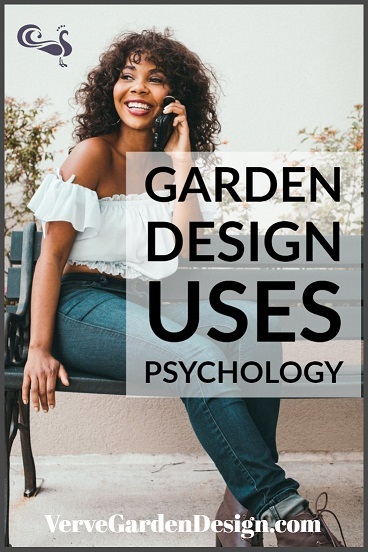 Garden design uses psychology. Image: Verve Garden Design. Garden Design is so much more than the art of making your garden look pretty. It's about making the users feel the way they want to when they are in it. Qualified garden designers will understand design psychology in detail, but there are many simple tips and tricks that anyone can use to make sure that their outdoor space actually gets used and enjoyed. Mostly it boils down to considering how the brain processes and responds to what the eye sees. Our eye naturally moves from one distinct object to another. If it has too many objects to take in, we can feel unsettled rather than relaxed. Used carefully though, a restrained mix of objects can create excitement, for example in an entertaining area where a party feel is needed. In contrast, a single bold object acts as a focal point This slows the eye down where you want there to be an interesting view or to signal where a path changes direction. We'll be explaining all of this more in the coming months so that your garden can feel like the sanctuary, family fun space, outdoor party bar or beautifully-planted view that you envisage. It's not as daunting as it sounds, so don't worry- you are in good hands here! Garden design balances considerations. Image: Verve Garden Design. You only need to look at the hundreds of garden design plans that we have on our Pinterest Board, "Drawing For Garden Designers", to see that there are many different layouts possible for gardens of the same shape. Even with similar elements such as paths, seating areas, garden buildings and planting borders, the design process arrives at the best layout for your garden by balancing sometimes conflicting desires. For example, sometimes there is not enough space for all of the elements on your wish list. There could be access constraints to the site or your budget may not run to something specific you had set your heart on. When you start to think about creating a garden with some design understanding, it is amazing what solutions you can come up to make the most out of your space. 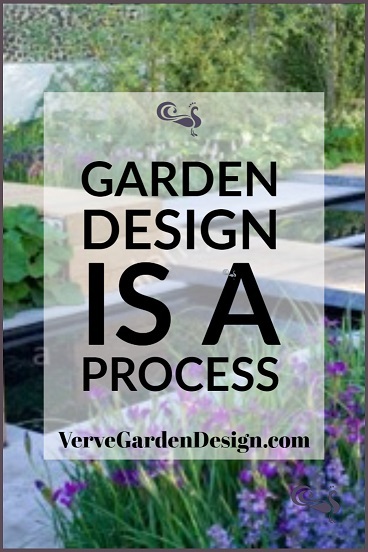 Hopefully, the tips and tricks we will be covering on the Verve Garden Design blog will give you the confidence to start planning your own garden with a designers eye! If you can't see 7 images in this post when viewing on a mobile device, click the link to "View The Original" or similar.